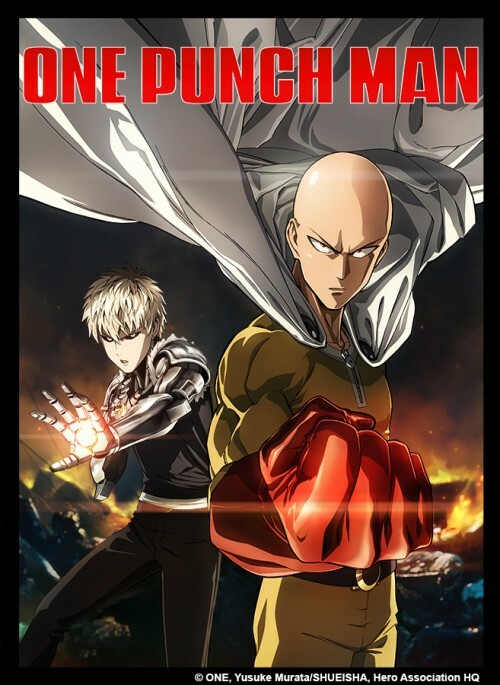 VIZ Media’s English dub of the widely popular anime, One Punch Man, made its debut on Toonami this past Saturday. Based on the manga by writer ONE and artist Yusuke Murata, the anime is finally stateside, so how was the inaugural episode? Exactly how it should be: equal parts action and comedy. The series circles around Saitama (voiced by Max Mittelman), a somewhat ordinary looking guy with a very unordinary power: he has become so powerful that he can kill any enemy with one single punch. Saitama, with such massive power, became a hero for a very different reason than the rest- he became a hero for fun. That’s it. No revenge origin story or upstanding moral backbone. No, this is a hero that simply fights evil because it’s fun, and does he ever fight evil. With this episode, we see Saitama, decked out in a very garish, yellow, red and white costume, battle a monstrous being that embodies mother Earth’s pollution, a murderous giant, a very strange car themed villain and mole people. That’s a lot of fighting for a first episode- but when it only takes one punch to end a fight, you can see how time isn’t an issue. The animation is by the world renowned studio, Madhouse, who brings the vibrant and crazy world of One Punch Man to the land of animation perfectly. The fight scenes packed a wallop, the character designs are fantastic, and the deadpan mannerisms of Saitama hit the nail on the head. VIZ has a hit on its hands with the English release of One Punch Man: the only bad part is having to wait a week for the second episode.